Are you an international student coming to Plymouth University to study? Find information, support and advice about living and studying in the UK. 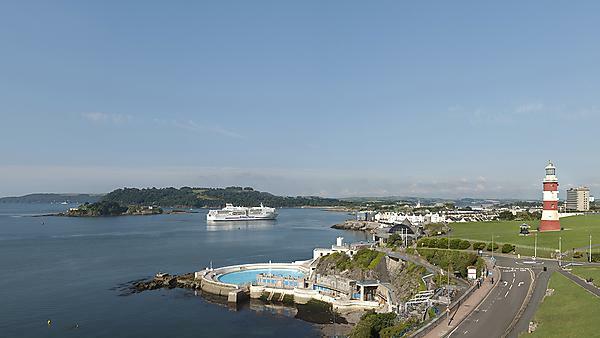 Plymouth is a small city situated on the western edge of the county of Devon. It's size means it has all the benefits of a smaller place, including a compact central area with accommodation, shops and entertainment facilities all within easy walking distance. Plymouth's status as a city means it has a distinctive cosmopolitan vibe and is a magnet for many different types of people, including tourists, students, workers and migrants. Many visitors to Plymouth are surprised by its continental feel and sense of community. The University of Plymouth values its community of international students and we recognise the unique pressures faced by this group who move to the UK to study with us. The University was ranked fourth in the Whatuni? Student Choice Awards 2018 in the international category and an important part of our support to international students is that we help make their transition to Plymouth a smooth one, allowing students to focus on enjoying life in the beautiful South West. Thanks to feedback and ideas from our students and the University of Plymouth Students’ Union, we’ve decided to partner with Your Guarantor to help international students secure private accommodation and overcome the hurdle of needing a UK-based guarantor, or having to pay their full rent up-front. Your Guarantor can act as a guarantor for students when renting in the private sector, and you can follow the link below to find out more including the terms and conditions. The university education system in the UK may be quite different from the education system you've experienced at home. the study support that is available. You might be a little surprised by the amount of self-study and free thinking required of a UK university student. We offer a number of learning support resources to help make the transition much easier for you. Want more detailed information about studying in the UK, including video and audio material, and online quizzes to help you develop your knowledge and language skills? Try out this free online resource developed by the University of Southampton in partnership with UKCISA. After the excitement of the first two weeks has worn off, it's very common to feel homesick and lonely. This is true not just for overseas students, but for British students too. So remember, if it happens to you, you really aren't alone. You may experience mood changes and strong reactions, feel lost and irritated. Its important to understand that this reaction is normal and these feelings will reduce as your new surroundings become more familiar. If you need someone to talk to, ISA is always happy to listen and offer support and suggestions to make adapting to the UK easier. If you and your family are non EU nationals and/or are ordinarily resident in any country outside the EEA and Switzerland, you will most likely be counted as an overseas student for tuition fee purposes. As an overseas fee payer you must generally fund yourself completely, or apply in your own country for whatever educational funding may be available. There's very little financial assistance available for overseas students in the UK, however you can find information on the University of Plymouth scholarships and bursaries. You shouldn't travel to the UK or begin a course of study without making sure that you have enough money to cover all your academic fees and living expenses. It's very difficult to make arrangements for financial support once you've left your own country. For help with budgeting and working out the costs of living and studying in the UK, try the international student calculator, developed by Brightside in partnership with UKCISA. Are you on a course that lasts for more than six months? All students studying on a course of six months duration or more, and their dependant family members, are entitled to NHS treatment in the same way as British citizens. Family members include your husband/wife, and your children aged up to the age of 16 or up to the age of 19 if they're in full-time education. You may still choose to take out additional medical insurance to cover situations that would not be covered by the NHS, such as dental treatment, optician visits and repatriation in a medical emergency. Are you on a course for less than six months? Students from an EEA country or Switzerland are entitled to necessary medical treatment while they're studying in the UK. If this applies to you, you should obtain a European Health Insurance Card (EHIC) in your home country before travelling to the UK, to demonstrate your entitlement. As a non EEA student, you should obtain private medical insurance before travelling to the UK. It's important that you speak to your bank in your home country before leaving. Ask if they have a special relationship with a UK bank that may help you to set up an account. It's also a good idea to ask them if you can use your cash card in cash machines in the UK to access money from your home country account. It can be useful to bring a bank statement, or a University letter addressed to your home country address, to help you open an account in the UK. It can take up to three weeks to open a UK bank account, so make sure you have access to money for this period. Some banks also require a local address to open the account, so depending on which bank you choose, you'll have to pay rent and a deposit to secure your accommodation first. Take a look at the International Student Handbook. You'll receive an updated paper version as part of your orientation.